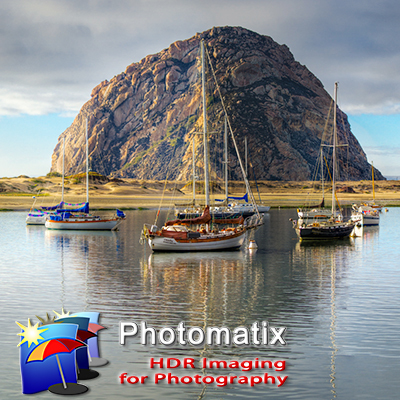 The image above is from our recent HDR Intensive course. The almost final product is a combination of many images, programs, and plug ins. I shot the scene with a Canon 5D Mk II, EF 17-40mm f/4L, Induro C213, and Really Right Stuff BH-55. I used the restaurant as a demo for the class and automating the bracket process. The bread and butter shooting sequence typically calls for three shots of 0, -2, and +2 EV. This did not work for the restaurant as the shadows needed more light than the +2 EV provided. I modified the exposure compensation to shoot another series of three shots yielding sufficient exposure of the shadows below the pilings and deck. Lightroom imported the six shots and I removed one of them before preparing them for the virtual TIFF export to Photomatix Pro. In Photomatix Pro I processed twice, once for realism and once for hyper reality. Both results are shown below. After reimporting to Lightroom via the plug in, I sent the two shots to Photoshop and created a stack. I modified the layer blend mode of the hyper realistic interpretation and did a little retouch work. I stamped the visible layer and then launched Topaz Detail to generate a little extra sharpening for content. Back in Lightroom I modified saturation and also did some painting with light using the Adjustment Brush. On a different note, we'll be announcing two big 2010 projects later this afternoon.